Hockey is a game of small victories. While there are big wins and brilliant seasons, every successful game and practice is punctuated by small victories. Whether it’s connecting with a teammate on a tape-to-tape pass, roofing a game-winner in traffic, or simply managing to navigate a lane of cones without losing the puck, these are the little triumphs that have so many of us coming back for more. And, so often, we come back for more because we want to get something a little more right than we did the week before. Was that pass in someone’s skates? Did you miss the net with the game on your stick? Maybe you lost the puck among the cones. Next week, or next month, or next year, we seek to make something magical happen out of our own hard work. That’s why we set goals. “If you set goals, it gives an understanding not just for the players, whether they’re 8U, 14U, 16U or 18U, everybody understands what the expectations are,” says USA Hockey’s Massachusetts District Coach-in-Chief Paul Moore. And that “everybody” includes more than just the players. Having parents in the loop can be just as much for setting standards as setting expectations. This gets into the realm of what makes for realistic goals. An 8-year-old likely shouldn’t be burdened by thoughts of what to do on a power play. “Obviously, at the younger ages, [goals] are not too lofty,” Moore says, pointing out that a 8U player shouldn’t be burdened by much of anything. Still, there is room for specifics. 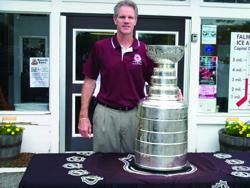 Moore, who starred for the Falmouth Clippers in high school before moving on to a playing career that included college hockey, the IHL and a training camp tryout with the New York Rangers, sits on Falmouth Youth Hockey League’s Board of Directors, and he’s coached up and down the age spectrum. He has for some time believed in developing players with realistic goals. At that point, age-appropriateness becomes key. And this has less to do a birth year and more to do with the skills that the individuals on a team have acquired. Benefitting the individual also plays into the American Development Model. The ADM, as it’s known, is USA Hockey’s initiative that, in its own words, “places a heightened emphasis on skill development and long-term athlete development principles,” to keep kids playing and developing in the sport from the first time they step on the ice through the age of 18. At the younger ages, the ADM’s focus is on small-area games and station-based practices, both of which Moore has run for years. It is part revolution and part evolution. And perhaps the most important of any list of realistic goals. It's skating, shooting and passing. But it’s mostly about skating. If you can’t skate, you can’t play the game. The rest of the stuff comes. At 8U, you can talk about stationary passing at 15 feet, and progressing to going around a cone and making a pass out of a corner. What's the progression from stationary stickhandling? Start moving your feet. When you implement the ADM, the small-area games, they're getting all the other stuff. They just don't know it. That's where you see the magic happens. Let the game be the teacher. Sometimes, we need to get out of the way. There's not a lot of structure to those games. There shouldn’t be. Offsides? Systems? It doesn't matter at 8U. Let them go. Let them fall down. Let them get back up. We're going to try to make you a better skater. We're going to try to make you a better passer. We’re going to try to make you a better shooter. Really, what you’re doing at 10U is progressing to tougher drills. But it’s the same principle. You're inheriting the 8U kids and you’re reinforcing all the same skills they learned a year before through repetition. For a 10U team, it might be learning how to break out of our own end. You may simplify it down to working on tape-to-tape passes in our own end. If you can't pass, you can't execute a breakout. [Practice] doesn’t need to be sophisticated and fancy and so difficult. But the adult coaches sometimes may not have that perspective. I've had coaches come up to me, 10U coaches, who say they want to work on a power play. Power play? The kids can’t even pass. I think we're talking about lifting the puck, maybe saucer passes. You always want to get kids out of their comfort zone. A 12U kid might be fine on breakaways or going around cones without confrontation. So what do you do? Provide confrontation. Throw a forechecker at [him or her]. Every kid has something to work on. If you have a 12U team, you might have kids who don’t skate very well. At 8U you might have kids standing in a row and passing [from a stationary position]. But it's going to look different at 10U or 12U. They're going to be moving their feet and adding progression. It's repetition. The skill development window closes quickly. It's between the ages of 8 and 12 or 14. You can go out and shoot baskets all day now and you're not going to get better, but if you’re 8-, 9-, 10-years-old, it’s repetition, repetition. It's the same concept at 8U, 10U, 12U: skill, skill, skill. Now we’re talking about body contact. [With small-area games of the ADM,] there's more contact, casual contact in competition. That helps accelerate development. Time and space are the two most valuable things in our sport, and that's what the opponent is trying to take away. We're simulating that environment at 8U. At 14U, you’re going to talk about a forecheck. Are you going to simplify it and make it a 1-2-2 forecheck, or are you going to make it a two-man forecheck. What are going to be the goals of that team? You don't talk about systems, in my opinion, until the kids get a little older. No matter what, remember to write down your goals, both as an individual and as a team. Keep coming back to those goals and adjust if needed. Keep working hard, and most importantly, have fun! The Taos Youth & Family Center will be closed on Monday in honor of Martin Luther King, Jr. Day. No Hockey, rec skate, or anything at the rink that day. Sorry if this is an inconvenience. The Taos Youth & Family Center Ice Rink will be closed on Monday, November 7, 2016. Kids that are typically dropped off after school will still have access to the facility, but not the Ice Arena. There will be no practices on this day.